During the years when the Revolutionary War transformed thirteen former British colonies into a new nation, a horrifying epidemic of smallpox was transforming—or ending—the lives of tens of thousands of people across the American continent. This great pestilence easily surpassed the war in terms of deaths, yet because of our understandable preoccupation with the Revolution and its aftermath, it has remained virtually unknown to us. The destructive, desolating power of smallpox made for a cascade of public-health crises and heart-breaking human drama. Fenn explores the many different ways this megatragedy was met, and analyzes the consequences. Her book is a signal contribution to the study of infectious diseases which immensely increases our understanding of the interplay between devastating pestilence and historical change. And it transforms our picture of the American Revolution. Fenn provides a dazzling new perspective that embraces the entire continent . . . A story that is timely as well as powerful and sobering. Pox Americana sifts carefully through journals and records of the late 18th century to reconstruct the path of the disease. Using resources as varied as the burial records kept by Catholic Priests in the Southwest and the diaries of explorers traveling up the Pacific coast, she pieces together a gripping, untold story and even tries to arrive at an accurate statistical tally for the seven-year blight . . . Scholarly yet detectivelike. 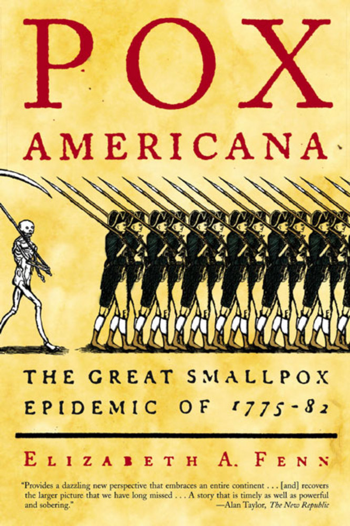 With Pox Americana, Fenn has made a stunning contribution to American Revolution studies. A considerable achievement and an extraordinary work of history that uncovers an episode that reshaped America as surely as the War of Independence.